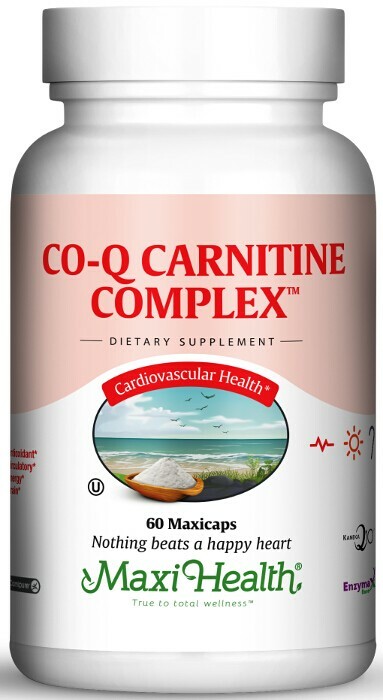 Co Q Carnitine Complex™ combines co enzyme Q 10 and L-carnitine. Co Q 10 is a fat-soluble vitamin-like substance found naturally in all forms of animal life. It is biosynthesized in the membranes of cells in humans and is vital in the production of energy. Its highest concentration is in the heart (the organ that requires the highest levels of energy for normal operation). The role of L-Carnitine in the body is that it aids in transport required fatty acids into the mitochondria to generate metabolic energy. It's the perfect partner for Coenzyme Q 10. Try Co Q Carnitine Complex™! Take one (1) Maxicap™ twice a day, or as directed. Other Ingredients: Vegetable cellulose, magnesium stearate, Enzymax® (calcium carbonate, bromelain, papain, lipase, amylase, protease, silica), rice flour. L-Carnipure® is a registered trademark of Lonza Group.